My name is Lorna Barrow and as your Public Speaking Trainer, I can help you transform your public speaking from average to AMAZING! Over the years, Public Speaking has been and continues to be the most influential and lucrative skill I have acquired. 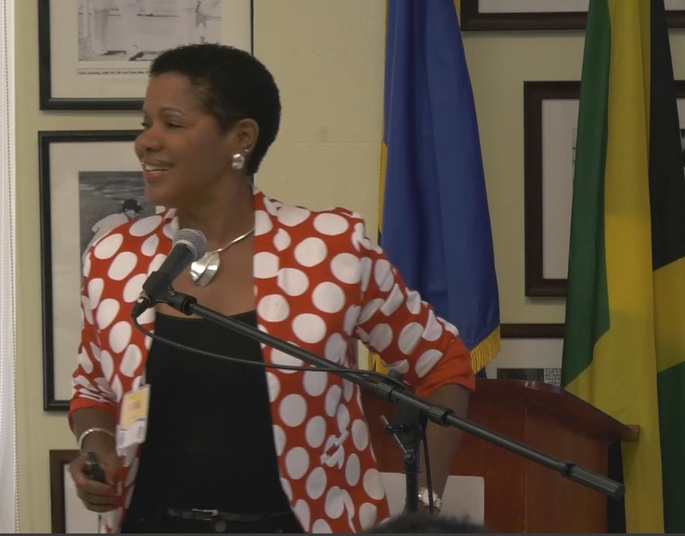 Delivered hundreds of technical, persuasive and motivational speeches in my job roles such as Accountant, Women’s Project Coordinator, Caribbean Congress of Labour and Executive Director of the Barbados Coalition of Service Industries. These speeches built goodwill for the organisations, connected them to their audiences and created opportunities for significant influence. They were delivered in countries and cities such as New York, Miami, Connecticut, London, Brussels, Edinburg and in countries such as Brazil, Guyana, Jamaica, Bahamas, Belize Curacao, Antigua, St Vincent, Grenada, St.Lucia and of course Barbados. Deliver training to thousands of participants through my business Impact Training and Development Services, including as a Public Speaking Trainer. These were delivered and continue to be delivered across many industries in areas such as Public Speaking, Debating Skills, Leadership and Team Building, HR for Small Businesses, Communication Skills, Power and Assertiveness, Report Writing, Conducting Effective Meetings and similar areas of the soft skills. Develop critical thinking skills which I use to write extensively on my blog, for ezinearticles.com, earning Platinum Expert Status for my articles, for LinkedIn Pulse attracting over 1,500 Top Level followers and growing. This has really enhanced my role as a Public Speaking Trainer. Personally connect with and influence influential persons such as Former British Prime Minister Tony Blair, former UN Secretary General Kofi Annan and many other Top Level persons around the Caribbean and beyond. Help me to be comfortable speaking in front of the camera on programmes such as CBC’s “The people’s business” and trident 10 TV’s “Entrepreneur Anonymous” and speaking on radio programmes such as VOB’s “Getting down to brass tacks” and other programmes around the Caribbean and other places. Coach scores of individuals one-on-one in public speaking and personal development . Conquer years of self-doubt and second-guessing myself to build my self-esteem and self-confidence to the point where developing, marketing and delivering the Top Level Speakers Programme for you is a breeze! You can learn more about me and my roles here, here, here and also here. She was awesome, dynamic, stimulating and most of all a very skillful communicator and public speaker! She was able to keep the audience’s attention throughout the presentation and people usually feel sleepy after lunch! 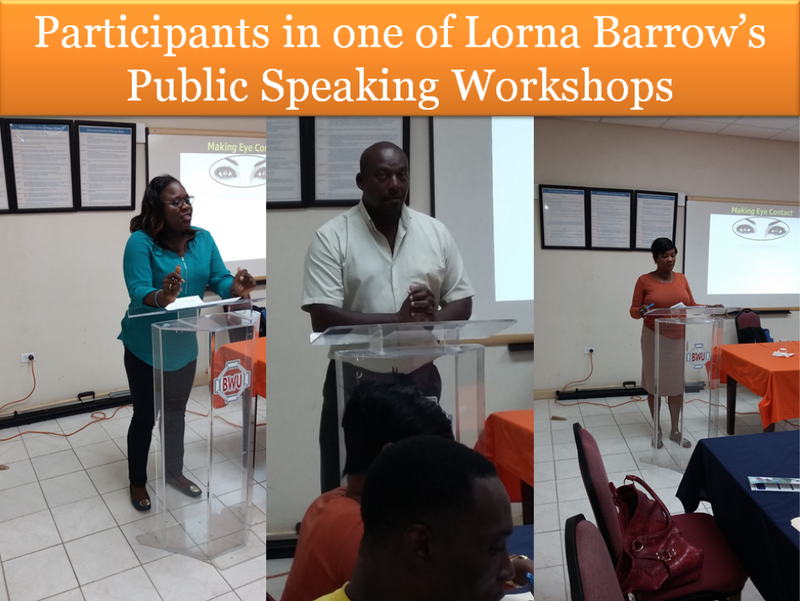 So when you are looking for a Public Speaking Trainer who acquired her skills in Toastmasters and honed them across the globe, them you need me, Lorna Barrow.